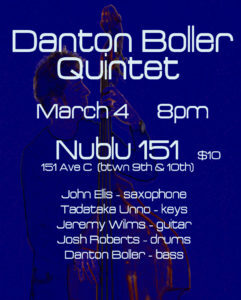 The Danton Boller Quintet will bring its fresh sound to Nublu 151. After years of sideman duties as bassist with top bands such as the Roy Hargrove Quintet, Bridget Everett, Seamus Blake Quartet, Elysian Fields, and Ari Hoenig’s Punk Bop, Danton leads his own band in search of a new musical dimension with his original compositions and arrangements. The Danton Boller Quintet features a stellar cast of NYC’s finest musicians: tenor saxophonist John Ellis is a standout musician of his generation, known for leading his own eclectic projects such as Double-Wide and playing as a sideman with a who’s who list of top NYC groups; Tadataka Unno, the most recent pianist in the Roy Hargrove Quintet, is the current pianist with legendary Jimmy Cobb, and is forging his own path as leader of his own piano trio; guitarist Jeremy Wilms is an accomplished producer, composer. and bandleader known in a variety of musical worlds, and has played with TV On the Radio, Antibalas, Chico Hamilton and is in the house band of “The Gong Show”; Joshua Roberts is quickly becoming one of the most sought after drummers in NYC and is lighting up the music scene with his dynamic and vibrant playing. Show 8-10pm followed by Ray Angry and the Council of Goldfinger, Spinning Frei Speech and Co.!